Nothing is better than homemade bread and that applies to this Indian-style Naan Bread, so simple to make, yet so delicious! Super easy to put together and so good you’ll never have store-bought naan again! I love fresh bread, there’s nothing better. The smell is what gets me every single time. Over the years I’ve certainly baked my share of breads and while I may have some favorites, in general I love all bread. I’m what they call equal opportunity when it comes to fresh bread. I’ve certainly baked my share of bread rolls and flatbreads, but sometimes I just love a good old naan bread to dip in some good homemade hummus or butter chicken. Naan bread is an Indian-style bread usually baked in a tandoor oven, which are these cylindrical clay or metal ovens. The great thing about tandoor ovens is that the temperatures can reach 900 F degrees which means these naan breads cook almost instantly, though I don’t think I’d want to stick my hands in these ovens and slap the dough on the side of it. I’m know it tastes way better, but for now I’ll stick with my trusted skillet. 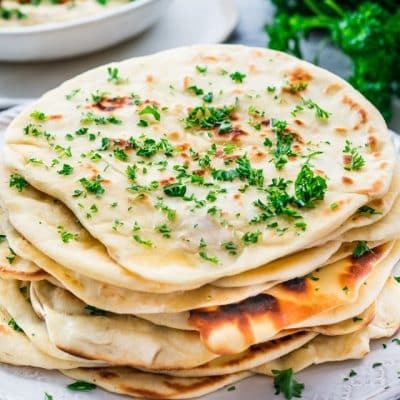 What Ingredients Do You Need For Naan? Active dry yeast – you can use active dry yeast or instant yeast in this recipe. If you use instant yeast then you won’t need to activate the yeast, just add it to the rest of the ingredients. Sugar – this is needed for the yeast, combine it with the yeast and water to activate it. 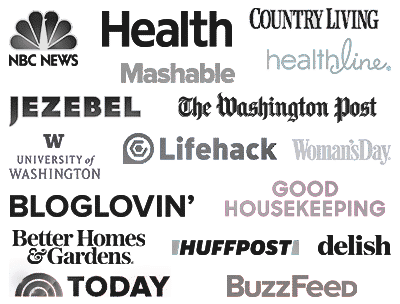 Yogurt – I recommend using a good Greek yogurt for this because I like the consistency of it. The yogurt will add a bit of mild acidity. Flour – you need all-purpose flour. Gluten free flour can be used as well, however the recipe can differ a bit. 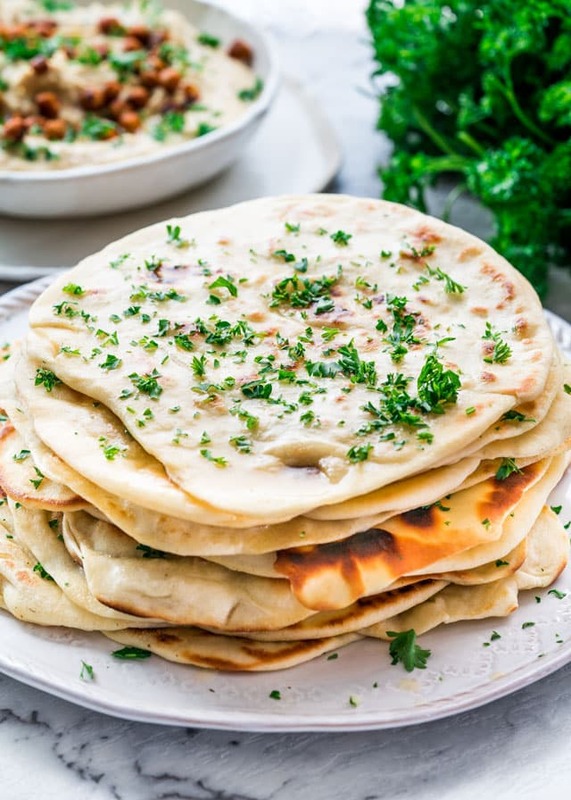 Olive Oil – You need olive oil to fry the naan. Butter – for brushing over the naan. Parsley – this is optional if you want to sprinkle some over the naan. The dough for this naan bread is actually quite simple with just a handful of ingredients. I used active dry yeast which you have to activate first, but you may also use instant or rapid yeast which doesn’t require you to dissolve the yeast in the lukewarm water and sugar, though you still need to add those ingredients. The dough should actually double in size fairly quickly, assuming your yeast is good. Cut the dough into 12 pieces and roll each out into a thin circle. You can either roll and fry, roll and fry or roll out all the pieces at a time, but I would keep them in between parchment paper so they won’t dry out or stick to each other. You will also need a hot skillet so that you can fry these breads. I usually add about a tsp of olive oil for each bread and brush it in the skillet so that it’s evenly distributed. The naan should cook fairly quickly, about a minute per side, but again it depends on how hot your skillet is. You will notice that the dough will bubble up nicely as you cook it. As you fry pieces of naan, keep them covered in a towel so that they don’t dry out. When all of them are cooked, brush each one with the melted butter and garnish with some parsley. That’s all there is to it! 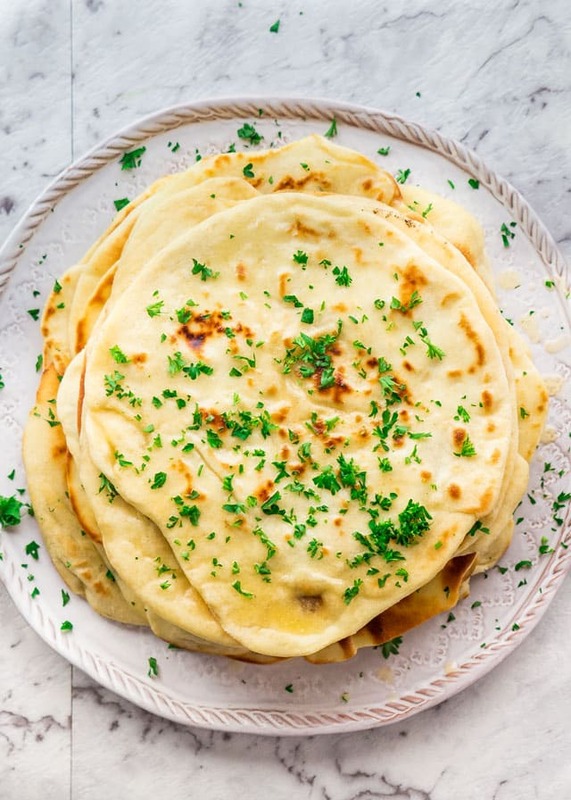 There are so many great things you can serve this naan with. 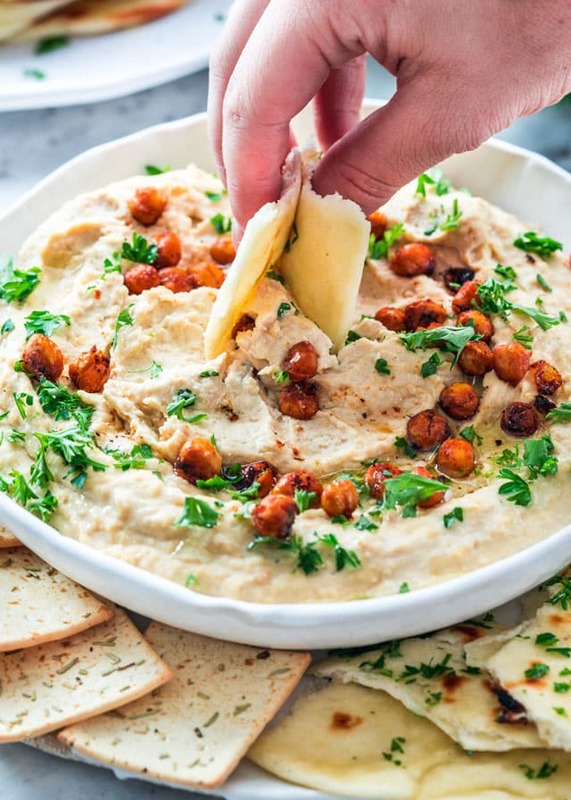 I personally love it with some good homemade hummus. I’ve also served it with an amazing butter chicken. But beyond these recipes, you can use to the naan to make gyros, wraps, the sky is the limit. Give this naan a try, I guarantee you will love it! Cool the naan first, then store it in airtight plastic bags at room temperature for up to 3 days. Absolutely! Naan can be frozen in airtight plastic bags for up to 2 months. 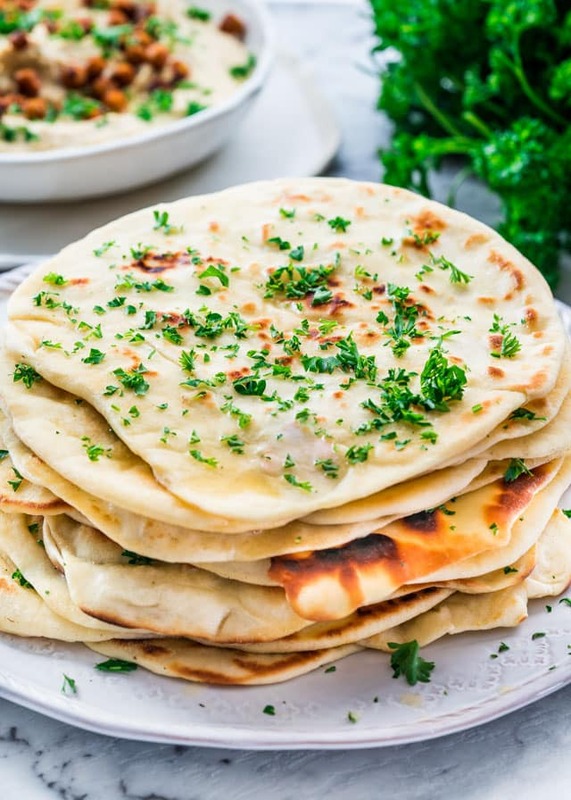 Nothing is better than homemade bread and that applies to this Indian-style Naan Bread, so simple to make, yet so delicious! Super easy to put together and so good you'll never have store-bought naan again! In a medium bowl, combine the yeast, sugar and water. Lightly whisk it all together, then let it sit for about 5 to 10 minutes or until the yeast dissolves and starts to foam. To the same bowl, add the oil, yogurt, egg and whisk well. Set aside. To the bowl of your mixer, combine the flour with the salt. Add the yeast mixture and mix for a couple minutes, until the dough comes clean from the sides of the bowl. If the dough is too wet, add a bit more flour, starting with a tablespoon at a time. The dough should be nice and soft but not sticky. Place the dough in an oiled bowl and cover it with a clean kitchen towel or plastic wrap. 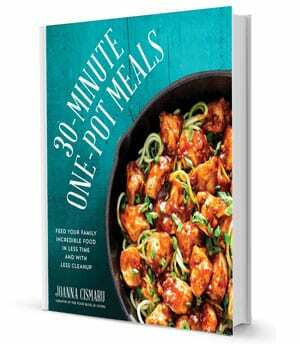 Turn OFF your oven, place the bowl inside and allow to rise for about 30 minutes to 1 hour or until doubled in size. I use this trick all the time to speed up the rising time. Mine only took about 40 minutes, so the time depends on your yeast and your environment. After it rises, cut the dough into 12 equal pieces and shape each piece into a small ball. Heat a large cast iron skillet over medium-high heat and add about 1 tsp of olive oil. Roll out one ball at a time until it's about 1/3 inch thick and about 5 inches in diameter. Add the piece of rolled dough to the hot skillet and cook for about 1 minute, the skillet should be very hot, so you'll see bubbles forming as you cook the dough on the first side. Flip the dough and cook the other side until the bottom is golden. Repeat with remaining dough until all of the pieces are cooked. Keep the naan covered in a towel so that it doesn't dry out. When all of them are cooked, brush each one with the melted butter and garnish with some parsley. All about yeast: Always check the expiration date on your yeast and make sure it hasn't expired. All your yeast products whether it’s in a jar or a package should be stamped with a “Best if Used by” date. Always make sure you check this date, even when you purchase the yeast, who knows it could have been on the shelf past its expiry date. One thing to remember about your yeast, is that it is a living organism and over time it will lose activity, even if you’ve never opened the jar or package. So if you don’t bake often, buy the smaller yeast packages rather than a big jar of yeast. Make sure your water is not too hot or it could kill the yeast which will cause your dough not to rise at all. The ideal temperature for the water should be between 105 F degrees and 110 F for proofing. While 95 F degrees is the best temperature for yeast to multiply, that's not warm enough for proofing active dry yeast. Tip: To help your dough rise faster, heat up your oven to 200 F degrees, then turn off the oven. Place your dough in the oven, close the door and let the dough rise in peace for about 30 minutes. Total time includes time required for the dough to rise, though that could vary from person to person. Could I use the griddle on my stove (non-stick surface) rather than a cast iron skillet? Thanks – the recipe sounds yummy! I love Naan. I have made it on a grill, using a pizza stone. I got the stone very hot and the naan came out great. However the best time was when I was on a business trip to New Delhi. We were working in the man’s home and they prepared lunch for us. The naan was cooked in their tamdoor oven. It was the first time I’d had naan and it was unforgettable. Hi Jo. What can I replace the yogurt with to make this plant based? Would soy yogurt work? I have an egg replacer. But I wanted to check on the yogurt. Thanks! Hi Andrea! I can’t say I’m tried soy yogurt before, so I’m not quite sure of its texture and taste. However, I don’t see why it wouldn’t work. If you do give it a try, do let me know how it turns out. Is there a substitute for plain yogurt? I do not have plain yogurt. Fantastic recipe! Perfect directions and helpful tips made for a delicious Naan to accompany our daughter’s equally delicious curry. Thanks for sharing your expertise. P.S. – you’re really pretty. Do you have to have a mixer for it, or can you just hand mix it? You can knead it by hand. Make sure you knead it until the dough is soft and elastic. Paired this recipe with your butter chicken recipe and it did not disappoint! Yum, bet they were so good! Do you think I could pre-roll this out and freeze some to fry up later?